Headed out on a camping trip? Need to stock up on gear before the upcoming season? Or perhaps looking, as a fan, to show off your pride in a new way? Stop into these Ocean State sporting good stores for the best athletic uniforms and equipment out there! Shop for all of your favorite, golf, lacrosse, tennis, soccer and football brands for a whole lot less! Second Time carries new and used sports equipment for every activity you could think of—so stop in and start saving up to 80 percent on their huge selection. DMK prides itself in being the largest soccer store in Rhode Island. 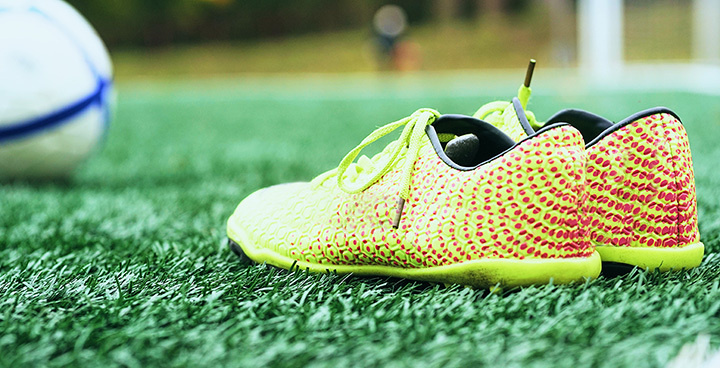 Grab a pair of cleats in every color imaginable, with sizes stocked for both kids and adults. There are special sections for those who play in indoor leagues or on turf, making their products perfectly catered to your every soccer need. First Place Sports is less a place for athletes as it is for sports fans—come here to stock up on all of the jerseys, hats, and sports gear that any proud fan will need. Show off your team spirit, and make a stop in! This center is the state’s largest team dealer. Order customized apparel or equipment in bulk for your team. They have all major brands available for baseball and softball, plus a wide array of uniforms for basketball, football, cheerleading, soccer and hockey, too! Love running? Then Rhode Runner is the place for you! Located on North Main Street, at Rhode Runner you’ll find all the brands to keep you comfortable as you jog across the Ocean State! The owners Bob and Colleen Bischoff also love hosting events, in addition to finding the shoe that’s perfect for you. The customer service is unbeatable! Sandy Lane is best for those who play out on the ice—hockey players, that is! Sandy Lane is the go-to location for those searching for sticks, pucks, masks, skates, jerseys, and embroidery for team apparel. Located in the Warwick Mall, Diamond Legends sells fantastic products at an even better price. This is one of the only places in Rhode Island you should go to purchase memorabilia—you’ll be pleased with the friendly customer service as well. Going camping anytime soon? First make sure to check out Eastern Mountain Sports, a New England sporting goods favorite. They’ll have all the outdoor gear you need to get out there and start adventuring. Bob’s is always putting on incredible sales—so you’ll have to hurry up to your favorite location of this New England retailer sooner or later. Get the most out of great brands like Nike, Reebok, and Adidas, all of which are heavily stocked at Bob’s. For over 50 years, Alpine Ski and Snowboard has been the place to go for those who spend time in the mountains during the winter! They offer seasonal ski gear, junior trade-ins, snowboard leases, and custom ski boot fitting! A word to the wise: you might not want to stop in during the summer, as the store only runs hours sporadically.